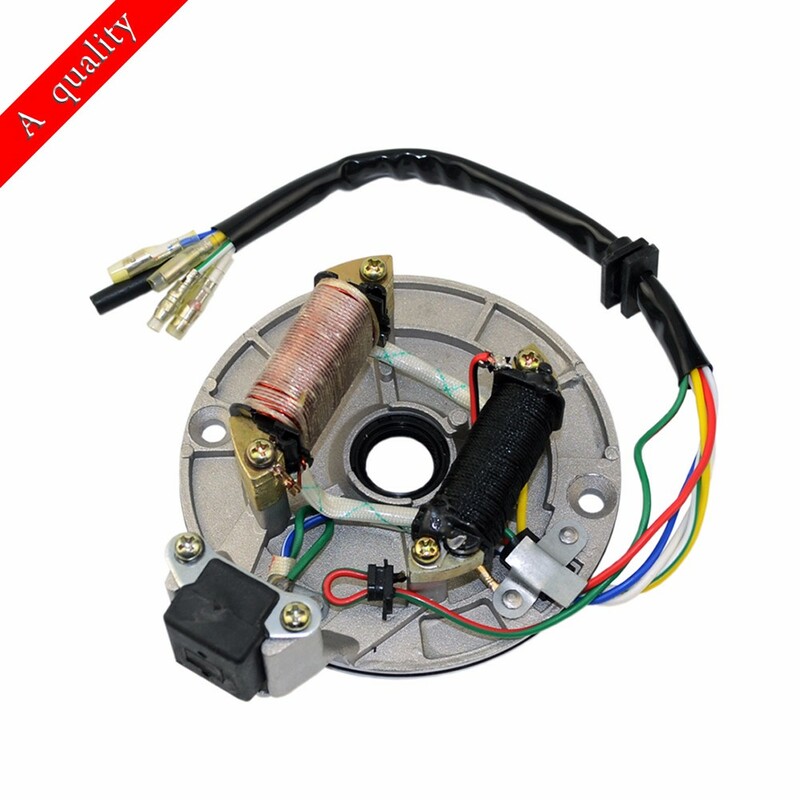 This Brand new Stator is for 50cc,70cc,90cc,110cc,125cc dirt bike 4-stroke engine. 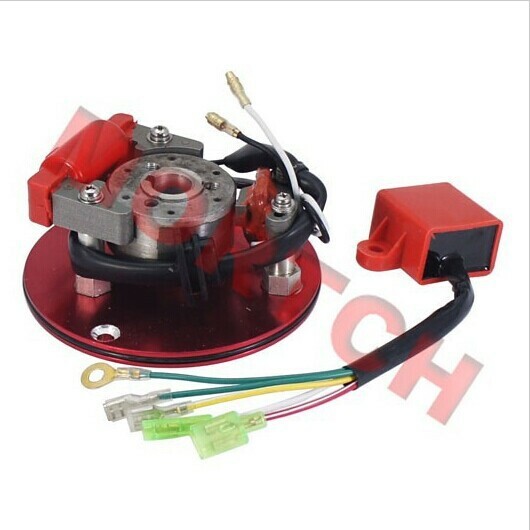 It has 2 coils and 6 wires with plate and seal, it is same as the stator with 5 wires - you can just take off the wire of red and green. The dimension of Center to center Mounting holes is 4". 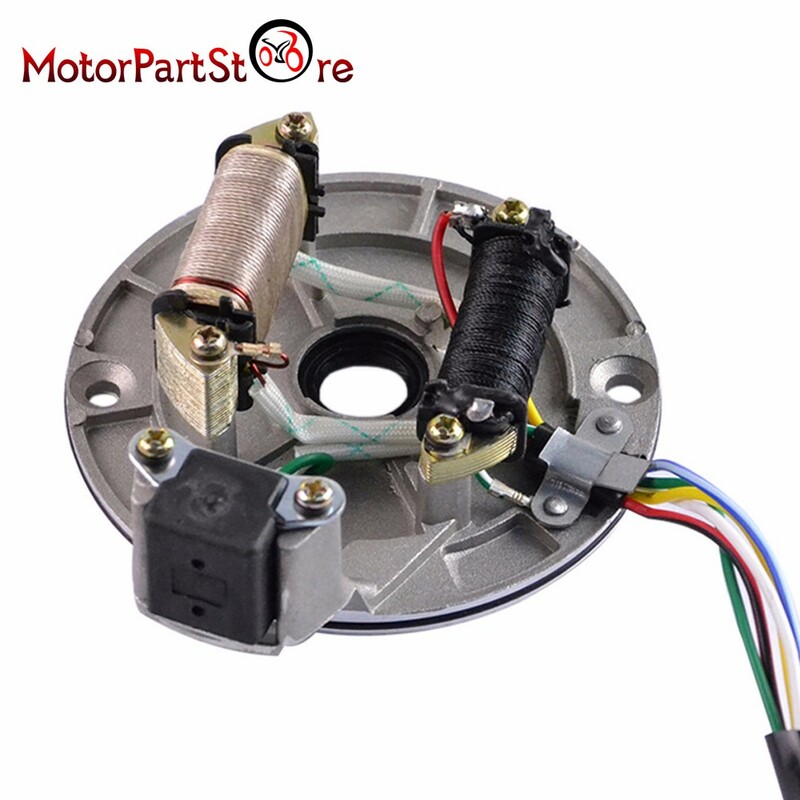 This assembly is perfect for replacing your broken trigger assembly which happens often when the Chain comes off and breaks off the ignition trigger!! Get your bike running again! Please double check the picture before you place orders, and if you have any questions, pls contact us, thank you so much!!! We will ship your order within 1-5 business day after received the clear payment. All shipping includes postage and handling fees. Import duties, taxes and charges are not included in the item price or shipping charges. These charges are the buyer\'s responsibility. Please check with your country\'s customs office to determine what these additional cost will be prior to bidding/buy. 1. If you are satisfied with our service, please rate the details of the transaction (Detailed Seller Ratings) with a "PREFECT 5 Stars" and leave us a positive feedback. We will do the same for you. 2. Feedback is very important. We sincerely hope you can contact us immediately BEFORE you give us neutral or negative feedback, so that we can satisfactorily address your concerns. It is impossible to address issues if we do not know about them. Thank you. If you have any questions, Welcome to contact with us. We will answer all questions and resolve any problems as quickly as possible. Business Hours: Mon-Fri 09:00-18:00 (China Time GMT+8). 1. We try our best to reply to your emails as soon as possible, however, due to high volume of daily incoming emails and time zone difference, we may not be able to reply your emails immediately. Please allow 1 business days for us to response. 2. If you do not receive any reply from us, please check your email ensuring your mailbox has not reached full size.